A stamp collection can be whatever you want it to be! Your stamps can be mint or used. Mint — New stamps that have never been used. Used — Stamps that have served their intended purpose of carrying the mail. How do you want to collect? Two popular ways of collecting are topical or country. 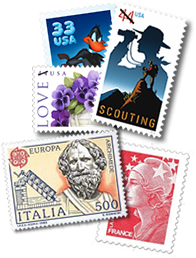 Topical Collecting — In this type of collecting you gather stamps, envelopes, postmarks, etc., related to one specific topic. Animals, birds, flowers, ships, space, scouts, Disney, and sports are just a few of the topics you can collect. Country Collecting — You may choose to collect stamps from the country where you or your ancestors were born. You may have a special interest in a country because you, a parent, or a friend visited that country. The MOST IMPORTANT THING about stamp collecting is that YOUR COLLECTION is FUN FOR YOU!